Seriously, Peter? 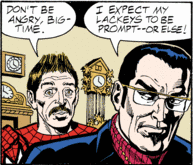 You can't believe that the Daily Bugle is calling you public enemy number one? The newspaper which, at the best of times, simply doesn't mention you at all and at most other times asks whether you're a threat or a menace? You can't believe they're calling you public enemy number one? Sigh. A few more days like this and all the progress this strip has made in actually being good will be for naught. TIL: Spider-Thug's gestures. In fact, I can't think of one time he hasn't had a comical facial expression or gesture. Today's strip is either a condensed version of yesterday's strip, or perhaps Big-Time and his henchman are just repeating themselves. You would also think Big-Time would think, "Hm, this Spider-Man costume is missing something." Oh well. On the plus side, Big-Time seems much happier today than he was yesterday. I suppose that's good. TIL: Spider-Thug's pose in panel one. It looks like he's dancing. Ahoy there, Spider-Buddies! Sorry about posting the new poll of the week so late. I've been busy fighting crime. I am a superhero, you know. Last week, I asked if you... well, here's what I asked and how the voting turned out! It was looking up for a while there, wasn't it? Perhaps good times will find us again. For now, though, I would like to ask you about the site layout. What do you think about it? If you don't like it, feel free to leave us some suggestions! Big-Time was innocent of any crime, though, right? I mean, yes, we'd all be mad if someone sent us to prison but if we served our time we might even let it go and be glad to be reformed. So perhaps Big-Time is actually innocent, and is angry at being sent to prison for a crime he didn't commit? I'm glad that's been cleared up. That could have been as bad as that whole debate over whether or not Spider-Man was an elephant. Thanks for setting the record straight. So we finally see how the daring robbery was accomplished! Except, uh... did they take the silk rope with them? After all, Spider-Man's webbing dissolves after about an hour. If they left it there, it could be a tell-tale clue that this nefarious imposter is not the real web-slinger. That, and the fact that it's a length of silk rope. TIL: The fact that Spider-Thug looks like Jimmy Olsen with a mustache. Big-Time's plan is sound, if lacking in several details. However, the real gem today is the second panel. It is, perhaps, one of the best responses to Spider-Thug's almost question I can think of. Yeah, he was guilty, but that's the past. He's looking towards the future of menacing Spider-Man and totally ruining the wall-crawler. Good show, Big-Time. Also, the fact that he's served his prison sentence means that, unlike many villains, Big-Time is honestly and truly reformed. Not only that, but he has made himself a new life as some sort of clock shop person. So his war against Spider-Man goes from "typical thing villain does" to "potentially ending this new way of life for him, but he doesn't seem to really care or get that." He doesn't seem to realize that masterminding these crimes is a good way to get sent back to jail. Big-Time: More complexity than anyone was ever expecting from this strip. TIL: I already said the thing I liked, in the actual meat of this post. I'm not going to say it again, as it would be redundant. A-ha! The Spider-Imposter only has six legs on his spider costume. A quick look at the previous few weeks tells me that this has always been the case, I just didn't notice it. Very clever, Mister Lieber. Very clever indeed. TIL: Both of Big-Time's lines today have something to do with time. Fantastic. Peter has sat down to read the newspaper. I believe it's a Daily Bugle with a story about the Spider-Imposter, so maybe he's lazily looking for clues. As long as he doesn't watch the television, we should be okay. As of right now, he's just overhearing it. TIL: Maria damning Spider-Man with faint praise. Why, by hunting him down and beating the living daylights out of him, of course. Silly Mary Jane. On a meta note, we have a lot of ads now. This is so that I can maybe make a tiny bit of money. Sorry. With a surprising rise in quality comes a surprising surplus of panels of the week. Five, to be exact. #5 - 09/20/2008 As you can see, our first panel features the debut of what is perhaps the sensational character find of 2008: Big-Time. Unlike other men in suits we've had, who are usually pretty generic, Big-Time has a gimmick. This rises him out of generic man-in-suit territory and puts him into generic super-villain territory. Which is a big step, let me tell you. #4 - 09/17/2008 I chose this one because I like the facial expressions in it. Look at the sneer on that burly thug. Oh, and the old lady looks like she's trying to cast a spell. That would have been terrific if she had cast a spell. #3 - 09/15/2008 I like the pasty white officer's exclamation of "WHA!" and Spider-Man's wisecrack. Little did I know how much wisecracking we'd get as the week went on. #1 - 09/18/2008 Somewhat interesting art? Spider-Man delivering some justice while hanging from a web and wisecracking? The justice being done on a friendly, neighborhood level? Why, this is a much better way to show Spider-Man! There you have it, folks. With the introduction of Big-Time, we can only guess that he's going to be involved in next week's Panel of the Week. What? He chose that one? Well, I guess we can count our blessing that he didn't send me the one with negative exposure. I'll get that up after I give you the poll for this week! What to ask, what to ask... ah, I know! Do you think the strip's gotten better over the past week? I'll try to think of something better next week, Spider-Buddies. Until next time! First off, some meta-stuff: new poll of the week and Panel of the Week up later today. Now, on with the actual post! 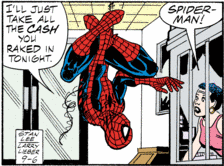 Today, we get clarification that the classic snarky Spider-Man is not the same Spider-Man who went to go see Big-Time. There was some worry about that, yes. Spider-Man is also being rather cocky today, something else that's rather classic. Also, acrobatic, which is whiz-bang crackerjack. We also see that Big-Time is, in fact, wearing a watch on a chain around his neck. Big-Time is fantastic, and while I'll no doubt regret saying this as the weeks drag by, I look forward to spending this time with him. TIL: Big-Time. He may be this year's break-out character. And so we have the awe-inspiring solution to the mystery of WHO IS THE SPIDER-IMPOSTER? It's some random guy with a mustache and bad hair. This follows the pattern of having a super-villain in the strip, followed by some random crime boss. 4) He operates from a place filled with clocks. If that chain around his neck is a watch, then it's safe to say that this fellow is pretty much a more management-oriented version of DC's Clock King. The original one. This one. (That second link is not Land Captain approved.) I might actually like Big-Time. 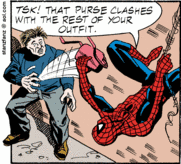 Yes, it may seem like a cop-out, but Spider-Man does this all the time. I do hope he at least webs up that burly thug. TIL: How much the burly thug is sweating. This is classic Spider-Man, right here. Cracking wise, doing some good, hanging upside down. The only thing that's missing is him webbing up that guy who looks like a more muscle-bound Weasel with worse hair. While I like that the strip is actually good right now, it sort of makes my job as a commentator a little bit unneeded. 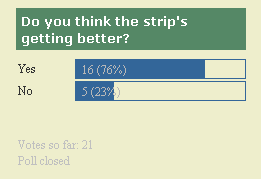 So do I hope for the strip to get terrible again, or do I hope that it stays moderately decent? I honestly don't know. Also, can anyone read that thing that looks like an e-mail address between the second and third panels? I can't make it out. TIL: The burly thug in panel three. Or should I say the burly thug not in panel three? Since when does this strip do artistic flourishes like that? ...well, this was a bit unexpected. Spider-Man actually doing something heroic instead of just moping. It'll probably end with the old lady screaming at Spider-Man, but he's actually trying right now. I think something is up with Stan Lee, as this strip's been pretty competent over the past week or so. 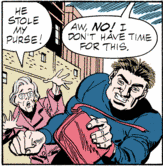 TIL: How burly the purse-snatcher is. 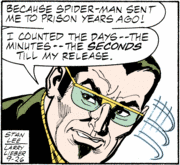 The last panel of today's strip accurately sums up the usual mindset of Peter Parker in most mediums he's appeared in. All in all, since this storyline debuted two weeks ago, the whole thing has been more like an actual Spider-Man story than any that have been covered on this blog. I'm sure he'll get knocked out with a brick pretty soon, or go sit at home and whine or something, but for now I'll enjoy it. TIL: I like Spider-Man's pose in the second panel. Larry Lieber, if he's actually the one drawing the strip, usually doesn't do things mid-pose like that. As is usually the case with Monday strips, this one basically recaps things that happened yesterday. Except I like this version much better, since Spider-Man makes a wisecrack while he's making things much more difficult for himself. In fact, he's far more flippant and talkative in this version, which I think is much preferable to him whining yesterday. If those cops are in the strip much more, then I'll have to give them meta-tags. Spider-Man: With the proportionate ability of a spider's knack for making things worse! TIL: Either the fact that the police have established a sort of barrier separating the overturned car from the crowd, or that big exclamation point in the second panel of the second row. This panel of the week thing is becoming a daunting task, but at least there were a few more good panels this week. #3 - 08/31/2008 Since it's such a major plot point, I would be neglecting my duties if I didn't include this panel of Spider-Imposter flipping over a car in the running for panel of the week. So here it is. #2 - 09/08/2008 Not much Spider-Man about it, but like Land Captain, I like the way the street looks. #1 - 09/12/2008 Well, here it is. Your panel of the week. Not much to say about it, except it made me go on a tirade. Also, it has Spider-Man throwing himself into more trouble with the cops. Hooray? Next week should be better. Now, we all know this isn't the main Marvel universe, simply because if it was, there'd be a great deal more face-kicking and elaborate poorly done crossovers. There's also not a whole subsection of the population who can, by themselves, overturn a car with their "bare hands". However, I have seen several other individuals in the strip who can do just that. Namor the Sub-Mariner, for one. The Rhino, for another. Perhaps the X-Men's Beast. I'm not entirely sure about the Hobgoblin and Doctor Doom, but I've seen them do such things. Ah, and Peter keeps on mentioning the Hulk whose whole thing is that he can overturn a car as easily as you or I could knock down a small chair. Now, I'm not saying any of those people could be this faux Spider-Man, I'm just saying the cop's assertion that no one else could have done it is wrong. Now, bare hands? Spider-Man is wearing gloves. If this were the real world, well, there wouldn't be Spider-Man for one thing. Ah, and the addition of gloves would at most protect your hands and wrists from various things, depending on the thickness of the gloves. Since this is a comic, however, wearing gloves can do all manner of things. Spider-Man himself is wearing a pair of web-shooters underneath his, and no one can see them. The Hobgoblin keeps an entire arsenal of things in his gloves. Doctor Doom's whole thing is that his gloves are weapons of considerable might, as is the Shocker's, though to an inferior degree. So the addition of gloves could easily allow someone to knock over a car in a comic strip. Ah, and Doctor Strange has been in the strip. When you put him into the strip, all bets are pretty much off because he sets a million precedents. So that cop is pretty wrong that Spider-Man is the only one who could have done it. 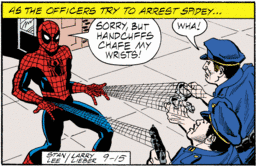 On top of all this, it is pretty amusing that Spider-Man thought that going to help the cops was a good idea at any point and time considering his dubious history with them. At least now he's come to his senses, somewhat. The fact that there's only two cops at the crime scene is laughable, as well, considering how it's probably a media circus. If it has been that long, why has no one turned the car back over? It's on it's side. A few guys could push it back onto its wheels no problem. TIL: I like the two cops, for some reason. Ahoy there, Spider-Buddies! The trial went pretty well, I suppose, but that's not why I'm here! Our pal Mike P has asked me to start a new thing here at the Amazing Spider-Blog since I guess you people think I'm pretty keen! Thanks a lot! Anyway, what I was asked to do is start a weekly poll. I'll pop in every Saturday, or thereabouts, and give you something neat to vote on. What's our first order of business? 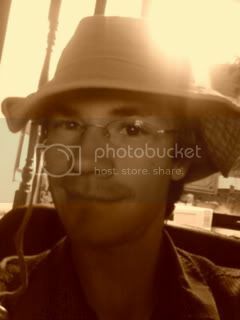 Well, we already decided what we wanted to name our Blogger, settling on Mike P. Now, what do we want him to look like? First and foremost, he could slap a picture of himself up on his profile, which I think wouldn't be a bad idea. Only thing is, he'd have to take a good one instead of the ones he takes with his phone. Or, he could use this character: That little guy is Mikep, and he's been Mike P's sort-of avatar since half of forever in "cyber-comics" and whatnot. Well, folks, there's your choices! I'd either make Mike P use a picture of himself or the green fellow, but that's just me. I'll be back in a week to give you a new thing to vote on. I originally read the last panel as "Okay, Mister Freeze!" and was going to go on a little tirade about how odd that is, since Spider-Man is not Mister Freeze. Heck, one is a Marvel character, the other is a DC Comics character and the two look nothing alike. 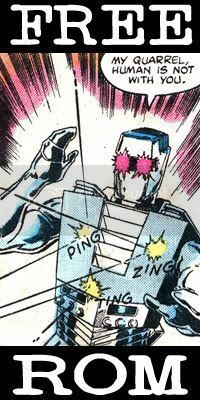 A random cop calling Spider-Man Mister Freeze would be so absurd that it would cause minor explosions. In my head. Then I noticed the little exclamation point after Mister, and... I went on the tirade anyway. Huh. TIL: It's nice to see Spider-Man doing something Spider-Man-ish. Even if it is being hunted and hated by the law. I hope you folks enjoyed Land Captain's blogging. I'm still going all sorts of insane for reasons I won't elaborate on, but I shall continue onward! Today's strip was pretty whiz-bang crackerjack, as it's sort of hard to mess up Peter Parker changing into his spider-suit in an alley. You'd almost think this strip was generally pretty fun and exciting from this strip. Only thing is, why does Peter look so sad in panel two? 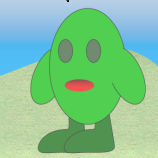 Is he filled with regret, or is it just a weird art choice? TIL: I like how each panel actually has a background. Well, Spider-Buddies, this is it for now. I've been subpoenaed. I'm sure the trial won't take too long, but just in case, I'm handing the reins back over to Mike P. Hope you guys had fun over this past week or so! Remember, you can find me occasionally over at Choose Your Own Blogventure! Yeah! Go get 'im, Spider-Man! We'll soon be seeing some good ol' fashioned fisticuffs for sure! Thing I liked? Looming fisticuffs! There's that dastardly Spider-Imposter pushing over that car again. That burns my biscuits more every time I see it, that does. Thing I liked? I guess that Al's TV has a pretty good window display! That Peter Parker and his television sets. He just can't seem to escape them! I liked the abstract-looking street in the first panel. #2 - 09/06/2008 This panel introduces our current ne'er-do-well, the Spider-Impersonator! He flipped over a car, people! He's bad news! This panel has Spider-Man swinging around, being happy. We don't see that nearly enough, in the strip or the actual comics. So it's going to be our panel of the week. Ahoy there, Spider-Buddies! I bet Mike P is kicking himself, because something actually happened in the strip today! As you can see, someone is using Spider-Man's identity to commit crimes! Is it Chameleon? Mysterio? Kraven the Hunter? One of the multitude of villains and uncommon thugs who have been able to impersonate Spider-Man? Do you think we'll find out soon, or will ol' Stan Lee drag out the mystery? I'm all a-tingle! Thing I liked? The juxtaposition of Peter's comments this week and the revelation that this storyline was going to be about someone impersonating Spider-Man! Don't be too hard on yourself, Spider-Man, your costume is a marvel of super-hero costume design. It's nice to look at, too. Gosh, it's hard to comment on these when nothing is going on. I can see why Mike P had me come in to do it. Thing I liked? I like the first panel best! It's nice to see Mrs. Spider-Man get some respect after that heckler a while back, isn't it, Spider-Buddies? Hopefully Spider-Man himself will get some of that respect soon enough, too! Oh wait, the little next box on Sunday said he'd be wanted dead or alive. I guess he'll get things thrown at him instead. Hey, that janitor's name is Mike! Do you think maybe it's a shout-out to the guy who usually does this blog? No, I don't think so either, but it'd be nice if it was! I have to do a thing I liked? Well, I liked the whole darn thing, but I guess I like the picture of Spider-Man swinging most of all. TIL: Spider-Man swinging in panel two. There we go! Until tomorrow, Spider-Buddies! Greetings, Spider-Buddies! It's your old pal Land Captain. Mike P or Mikep or Mike Podgorski or whatever he's calling himself now said things were looking pretty dire in the Spider-Man strip, and called me in to comment on it for a week or so until things become less dire. Hold on, by dire he meant boring, didn't he? Well, I guess I can still do it! Let's hope I can help make these next few weeks less "dire" for all involved! Also, not to worry, Mike will still be updating Choose Your Own Blogventure (which I'm in) and his web-comic PC/MS! What, you weren't worried? I'm going to start things off with a poll. Let's help ol' Mike figure out what he wants to be called, since the poor fellow can't get his head on straight. Why does Peter Parker look so weird when he's smiling? This is the second time he's done so in two weeks, and it still freaks me out. TIL: The first panel is a bit of all right.